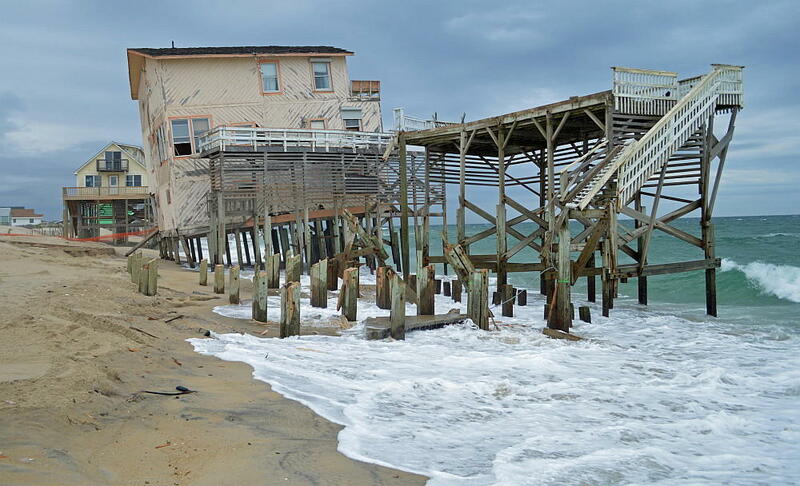 The new report predicts that sea level rise will range from 2 to 6 inches along the North Carolina coast over the next 30 years. Of course, the problem wasn’t solved. North Carolina was ridiculed by news aggregators, traditional media, on social media and in op-eds. Now, almost three years later, the scientists have come back with a new report. It still predicts that sea levels will rise, but since it only looks 30 years out, the amount of rise is not anywhere near the levels predicted in the first report. The changes made it much more palatable to the people who fought against the original. “We believe that the report before you today is a much better and thorough report that encompasses not only a scientific approach but just plain common sense that is applicable in today’s development world,” Heather Jarman, a lobbyist for real estate and development in Wilmington, told the Coastal Resources Commission last week in Dare County. She was hardly the only one offering praise. The shorter time frame was not the only change that diffused the politically-charged situation. Frank Gorham, the CRC chairman, also fought off calls to put climate-change deniers on the Science Panel and set up two out-of-state peer reviewers. 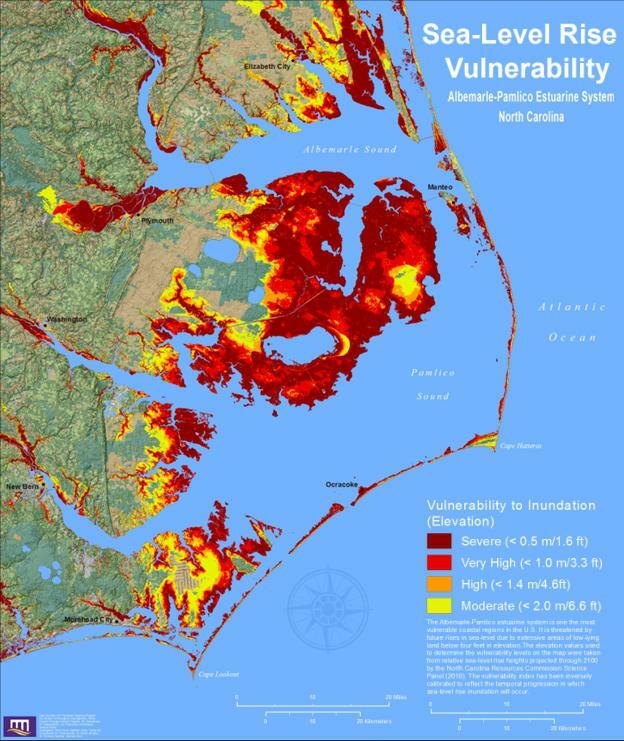 Sea level rise will impact a large portion of eastern North Carolina. Praise for the new report might be widespread, but it is hardly complete and universal. Many say looking only 30 years out will not help with planning large-scale public projects like bridges and hospitals that are designed to last longer than the three decade predictions. On the other side of the spectrum, some are still not yet ready to accept overwhelming scientific consensus. “The most important fact that everyone needs to understand about sea-level is that it has not accelerated at all in response to human greenhouse gas emissions,” said Dave Burton, a frequent critic of the Science Panel. Clearly, the debate will continue. What is unclear is what decision makers will do with the mild to moderate sea-level rise predicted in different locations by this report. Gorham, chair of the CRC, has already indicated that he thinks local communities are better equipped than the state to come up with new plans. Even if it does not prompt statewide action, the new report has already – in the minds of people like Larry Baldwin- accomplished an important goal. Baldwin is now a member of the CRC; before that, he was a driving force behind NC-20, the group of developers and land managers that fought so hard against the first report. The fight over the sea-level rise report has outlasted the show that brought it so much attention in the first place, as Stephen Colbert- at least the character – has retired. The new sea-level rise report will now go through a lengthy public-comment period before it gets to the General Assembly next year. Sea level rise along the North Carolina coast.